Interlude dans le soir (d’après l’après-midi d’un faune) is an original composition for 12 players (fl. – ob – cl. – hn. – 2 perc. – pf. – 2 vni – vla – vc. – cb.) which describes what may happen after the afternoon of a faun, based on an aesthetic research on the Mallarmé’s eclogue and Debussy’s musical concept. His first idea included an Interlude and a Paraphrase finale in addition to the Prélude. It doesn’t seem that the choice of composing just the first one was influenced by some “narrative” reasons; we know that, right from the start, Debussy was planning to realize not just a synthesis, but a very free illustration of those fugitive impressions: he did so. By the same freedom, in this “evening Interlude”, three impressionist-colours pictures try to discover the post-meridian mistery of the existence (using a phrase by V. Jankélévitch), without any advance of the night mistery of the nothing, throwing new shadows, new lights and, for this, new waiting horizons, moving the the immanence of an absolute, terminal time, already falling down to the twilight. Nadir Garofalo was born in Taranto (Italy) in 1986. He studied orchestra conducting with Ennio Nicotra, Giuseppe Lanzetta, Daniele Belardinelli, Donato Renzetti. In 2014, under the guide of m° Giusi Francavilla, he obtained the diploma in Piano at Istituto A.F.A.M. “G. Paisiello” in Taranto. On September 2015, he was commissioned by the Orchestra da Camera Fiorentina to write two original works (Tempus - Spatium. Bagatelle for Strings op. 7 ), conducted by m° G.B. Varoli in Florence for the first performance ever. On the 30th of October 2016, in the city of Taranto, he was invited to inaugurate the new season of the “Tarentum” theatre, with the Orchestra Taras quintet, piano and voices. For the occasion, he composed Communio, an original piece dedicated to his fellow citizens. In 2017, for the commission of Renata Arlotti (www.renataarlotti.com), one of the most important young Italian guitarist, he wrote Sakura-no Mai (The dance of cherry blooms), a piece for solo guitar which was performed at the 2nd edition of Tehran International Contemporary Music Festival, in Iran and which will be performed soon in Los Angeles, United States of America. On September 2017, he attended – as auditor – the Italian Opera Academy, a two-weeks course at the “D. Alighieri” theatre in Ravenna, held by m° Riccardo Muti on G. Verdi’s Aida. On March 2018 he graduated in Orchestra Conducting at Conservatorio “E.R. Duni” in Matera, with m° Daniele Belardinelli. Here he attended the choral composition course held by m° Vito Liturri and the composition analysis course held by m° Michele Maiellari, besides improving his skills with m° Nicola Samale (orchestration, analysis) and m° Aldo Ceccato (conducting symphonic and opera repertoires). He conducted various professional orchestras, such as the Orchestra da Camera Fiorentina, Orchestra di Toscana Classica, Orchestra Filarmonica del Veneto, Orchestra del Teatro Massimo in Palermo, Orchestra del Conservatorio “E.R. Duni” di Matera, OSN Mascalucia Etna Phil., Orchestra Senzaspine di Bologna. As the creator and co-founder of the Orchestra Taras, on May and June 2015 he launched a project to raise the public awareness and to renew the cultural sharing: “La Musica Spiegata” (The explained Music), after its 2nd edition, has collected the enthusiasm and participation of a growing audience. Since 2015, he has been working as Artistic Director of the Orchestra Taras Musical Association, for which he manages the public relations to the public and private authorities, the artists’ contracts and the legal fulfillments related to the performances. To this day, he has handled over 40 concerts, with the involvement of some of the most talented local young artists, ranging from a polished and even little known classical repertoire to contemporary composers, jazz, blues and rock music. He published a novel (Nel lampo di un incanto, Il Filo editore, Roma, 2007) and wrote some essays: Diritto e Musica. Paradigmi ermeneutici (Law and Music. Hermeneutic paradigms) published in www.dirittoitaliano.com, 2012; Intentio auctoris: profili giuridici e musicali di un enigma (Intentio auctoris: juridical and musical profiles of an enigma) published in the Annals of the University of Bari jonic department, 2014; L'interpretazione musicale. Elementi etici ed estetici (The Music Interpretation. Ethical and Aesthetic elements), 2014; Interlude dans le soir. Una ricognizione del fauno debussyano (Interlude dans le soir. A recognition of Debussy’s faun), 2018. 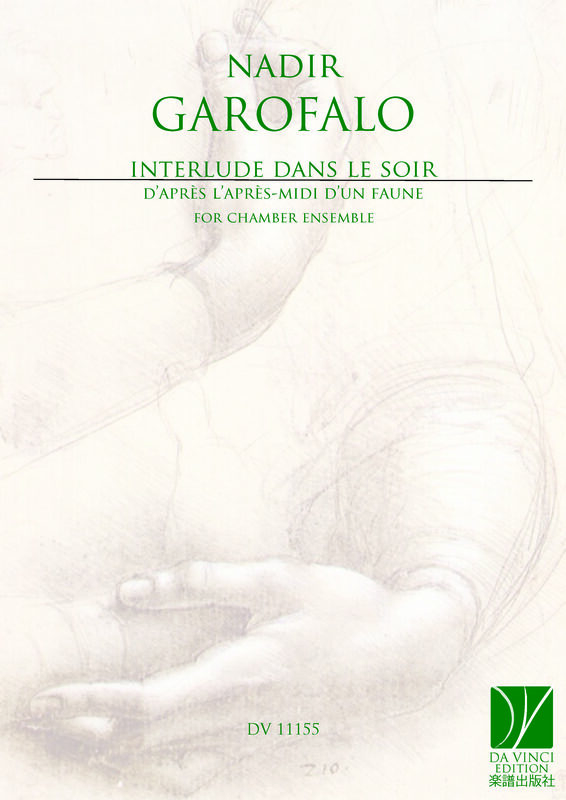 The latter has been merged into the introduction to the score Interlude dans le soir – d’après l’après-midi d’un faune - op. 14, released by Da Vinci Publishing.